On August 31, 1980, the trade union Solidarity was founded at the Lenin Shipyards in Gdansk, Poland. The Solidarity movement helped lead to the fall of communism in Eastern Europe. Thousands cheer the first Polish pope, John Paul II, as he celebrates mass in Gdansk, Poland. Many carry the red-and-white logos of the Solidarity trade union. On August 31, 1980, the trade union Solidarity was founded at the Lenin Shipyards in Gdansk, Poland. Solidarity became a symbol of anti-communism in the 1980s, and inspired other groups to oppose the Soviet Union and other Eastern Bloc governments. Solidarity was never simply a labor union. 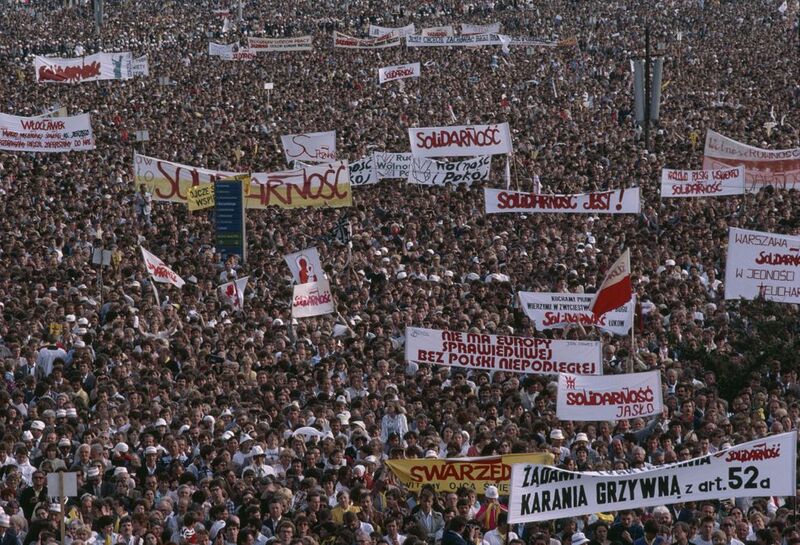 Although led by dockworker Lech Walesa, the union included leaders of the Catholic Church (who sought support from the Polish Pope John Paul II); students; and intellectuals who opposed the authoritarian government of Poland. At its height, nearly a third of all Poles were members of Solidarity. The military government of Poland tried to silence Solidarity and other critics by imposing strict martial law. When those rules were relaxed and semi-free elections were held for the first time in 1989, Lech Walesa was elected president. form of leadership where individual power is limited and the power of a single leader or group of leaders is strengthened. (1945-1989) states and nations in central and eastern Europe under the sphere of influence of the Soviet Union. to start or establish something. having to do with knowledge, or a knowledgeable person. legal system established and enforced by the military. to be or act against something.